1. Log in to your Moodle account and make sure your role is set to Instructor. 2. In the Administration box, find the Quiz administration folder. Select Results. 3. Under the Display options tab, you can select an individual quiz to regrade by clicking the check box next to their name and then clicking Regrade selected attempts; or select Regrade all. NOTE: You may also choose to Dry run a full regrade, which is to the right of the Regrade all button. Selecting this will let you see what the changes in these grades would look like without actually performing any changes. 4. 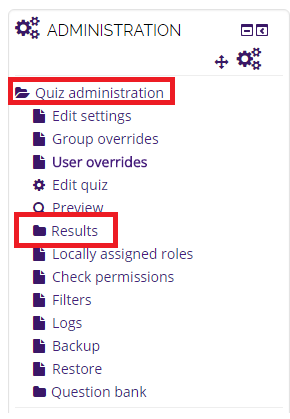 After you have completed step 3, Moodle will automatically regrade the quiz.